If this picture looks familiar it's because whenever you read or see anything about Copenhagen, this is probably the first image they show you. The very essence of Copenhagen-ness. This is where the tourists automatically congregate for coffee, a drink or a meal. We live just around the corner from Nyhavn, and it actually can be a nice place to visit when it's not quite tourist season. The big drawing factor is that it's on the sunny side of the canal, so it's warm and bright, and when the sundown arrives, you're looking right at it. "Det er bare hyggeligt", the Danes say, to sit outside at one of the sidewalk cafés and watch the people go by, the street musicians, the canal boats. No cars or usual city traffic allowed here, the cafés fill half the street and the pedestrians fill the other half, so the pace is easy and unstressed. There are all kinds of resturants here, some expensive, some cheap; seafood, italian, mexican, thai... but no McDonalds or other American franchises. Cafés and bars, taverns with live music. A very popular danish ice cream bar is on the corner, do try a gammeldags "old-fashioned" ice cream cone! But on a sunny summer day that cozy walking street simply fills up with walking people: Danes, Swedes, Germans, Americans, Italians...everybody shows up here. And then it's pretty hard to sit at a café because there are no chairs free, and sitting on the dock ramparts would be ok, but you'll have to wait your turn, because they're all filled up too. We tend to go around Nyhavn when it's like that. 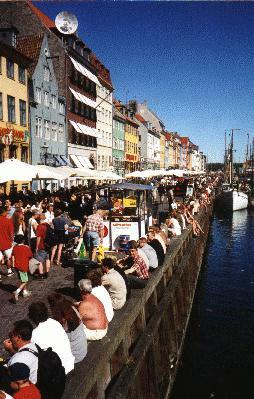 However, it's not always overcrowded, sometimes Nyhavn is perfectly peppered with just enough interesting people to watch-- and to talk to --easy enough when you're all sitting there together watching the sunset anyway, the moon coming up over the kanal (hi, Derek & Jennifer!). 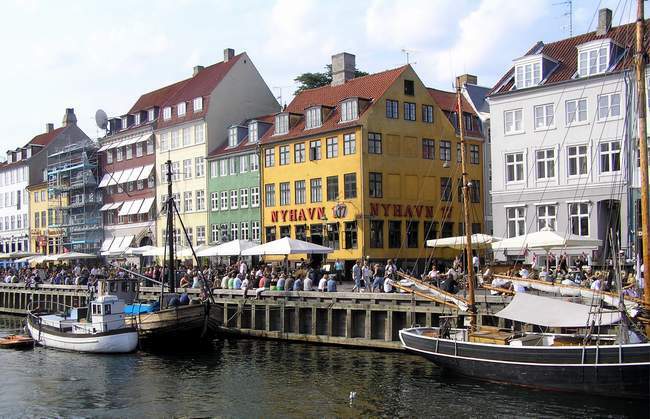 Pictured below: an especially sunny day at Nyhavn. Have fun.